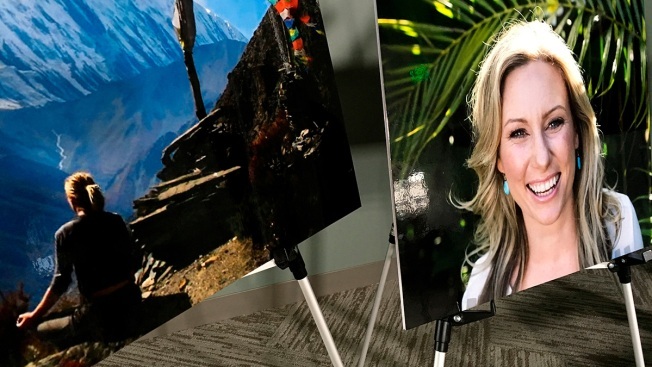 In this July 23, 2018, file photo, posters of Justine Ruszczyk Damond are displayed at a news conference by attorneys for her family in Minneapolis. A Minneapolis police officer who shot and killed an unarmed woman as she approached his squad car after calling 911 was reacting to a loud noise and feared an ambush, his attorney said Tuesday, calling the shooting "a perfect storm with tragic consequences." Mohamed Noor and his partner were rolling down a dark alley in response to a call from Justine Ruszczyk Damond, a dual citizen of the U.S. and Australia, who contacted police about a possible sexual assault. That's when a bicyclist appeared in front of them and they heard "a bang," defense attorney Peter Wold said. "It is the next split second that this case is all about," Wold said in his opening statement at Noor's trial on murder and manslaughter charges. The officer fired a single shot, killing Damond, whose death rocked both countries and led to changes in the Minneapolis Police Department. The shooting in July 2017 came just two weeks after an officer in New York was ambushed and killed in a parked vehicle. Attorneys for Noor, who was fired after being charged in the case and never talked to investigators, argue that he used reasonable force to defend himself and his partner from a perceived threat. But prosecutors say there is no evidence of any threat to justify deadly force. Prosecutor Patrick Lofton, in his opening statement, questioned a statement from Noor's partner, Matthew Harrity, that he heard a thump right before the shooting. Lofton said Harrity never said anything at the scene about such a noise and mentioned it for the first time days later in an interview. Investigators found no forensic evidence to show that Damond had touched the squad car before she was shot. That raised the possibility that she had not slapped or hit it upon approaching the officers, Lofton said. Neither Noor nor Harrity had their body cameras on until after the shooting, and there was no squad car video. Other officers who responded to the scene did not consistently have their cameras switched on either, Lofton said. A sergeant taking statements had her camera on when she talked to Harrity, but it was off when she talked to Noor, according to Lofton. "We'll never hear what he said," Lofton said. Damond, 40, was a life coach who was engaged to be married in a month. Noor, 33, is a Somali American whose arrival on the force just a couple of years earlier had been trumpeted by city leaders working to diversify the police department. Damond called 911 twice that night, then called her fiance and hung up when police arrived, Lofton said. One minute and 19 seconds later, she was cradling her wounded abdomen and saying, "I'm dying," Lofton added. Damond's fiance, Don Damond, was the first witness for prosecutors. He sobbed as he described calls from investigators the night of Justine's death. He said he was not told an officer had shot her until a second phone call. He said calling Justine Damond's father in Australia was "the worst phone call I've ever had to make in my life." Members of her family from Australia, including her father, stepmother, brother and sister-in-law, were in the courtroom Tuesday. Her father cried during portions of Don Damond's testimony. Justine Damond had taken her fiance's name professionally before their marriage. Earlier Tuesday, Hennepin County District Judge Kathryn Quaintance relented on restrictions that would have prevented the public and media from viewing video evidence introduced in the case. That's expected to include body-camera video that shows efforts to save Damond. Quaintance had cited a desire to protect Damond's privacy, but a coalition of media groups including The Associated Press challenged the ban. "The court, like the jury, must follow the law — even if I disagree with it," Quaintance said. Noor's attorneys have not said whether he will testify. If he does, prosecutors may be able to introduce some evidence that the defense wanted to keep out of the state's case, including his refusal to talk to investigators. They also could bring up a 2015 psychological test that showed Noor disliked being around people and had difficulty confronting others. Despite that test, a psychiatrist found him fit to be a cadet officer. The shooting raised questions about Noor's training. The police chief defended Noor's training, but the chief was forced to resign days later. The shooting also led to changes in the department's policy on use of body cameras.